To increase his asceticism he girded himself with an iron chain, in penance for the many sins he confessed to have committed, and lived only on bread and dates. During Lent he redoubled his austerities, and, in order to conform his life more closely to that of the anchorites of Egypt, ate nothing but root vegetables. He foretold the ravages which the Lombards would make in 575 in Gaul, and advised the monastics of a nearby monastery to flee at once. They said they could not resign themselves to abandon him, but he replied that although the invaders would insult him, they would not kill him. When the barbarians came to the tower in which Hospitius lived, on seeing the chain with which he was bound, they mistook him for a criminal who was imprisoned there. When they questioned him, he acknowledged that he was indeed a great sinner and unworthy to live, whereupon one of the soldiers lifted his sword to strike him. God, however, did not desert His faithful servant; the soldier’s arm stiffened and became numb. It was not until Hospitius made the sign of the Cross over it that he recovered the use of it. This soldier embraced Christianity, renounced the world and spent the rest of his days in serving God. 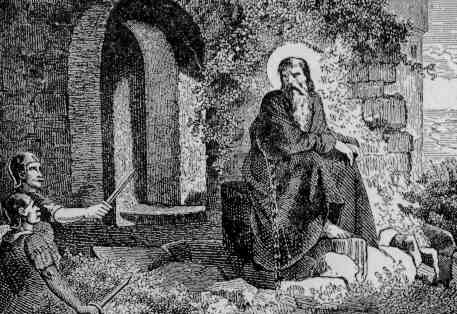 Saint Hospitius foretold his death and was buried by his friend, Austadius, Bishop of Cimiez. When he felt that his last hour was nearing, he asked the monks of the nearby monastery to send word to Bishop Austadius that he was going to die, so that he might see to his burial. He took off his chain and knelt in prayer for a long time. Then, stretching himself on a little bank of earth, he passed away peacefully and gave up his soul to God, on the peninsula of Cap Ferrat in A.D. 581. His relics were translated to Lérins on May 21, the day on which his feast is now celebrated. 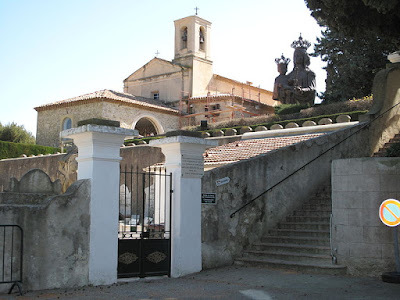 Saint Hospitius is still venerated in Nice at the Cathedral of Saint Reparata. The Cathedral Church possesses a small bone of his hand; other relics are kept in the churches of Villefranche-sur-Mer, La Turbie, and San-Sospis. There was at this time in the city of Nice a recluse Hospitius who was very abstemious. He wore iron chains next his body and over these a hair shirt and ate nothing but plain bread with a few dates. And during Lent he lived on the roots of Egyptian herbs such as the hermits use, which were brought to him by traders. First he would drink the soup in which they were cooked and eat the roots next day. The Lord did not disdain to work great miracles through him. For at one time the Holy Spirit revealed to him the coming of the Lombards into the Gauls and he foretold it as follows: "The Lombards," said he, "will come into the Gauls and will lay waste seven cities because their wickedness has grown in the sight of God, since no one understands, no one seeks God, no one does good to appease the anger of God. For all the people are unfaithful, given up to perjury, addicted to thievery, ready to kill, and from them comes no fruit of justice at all. Tithes are not paid, the poor are not fed, the naked are not clothed, strangers are not received with hospitality or satisfied with food. Therefore this affliction has come. And now I say to you: 'Gather all your substance within the inclosure of the walls that the Lombards may not take it, and fortify yourselves in the strongest places."' At these words all stood gaping and they said good­by and returned home with great admiration. He also said to the monks: "You, too, depart from the place and take with you what you have. For behold the people I have named draw near." But when they replied: "We will not leave you, most holy father," he said to them: "Don't fear for me; for they will offer me insults but they will not harm me unto death." The monks went away and that people came and laying waste all they found, they came to the place where the holy recluse of God was. And he showed himself to them at the window of the tower. They went all round the tower but could find no entrance by which they could come to him. Then two climbed up and pulled the roof off, and seeing him bound with chains and clad in a hair shirt they said: "Here is a malefactor who has killed a man and therefore is kept bound in these fetters." They called an interpreter and asked him what crime he had committed to be so confined in punishment. And he confessed that he was a homicide and guilty of all crime. Then one of them drew his sword to strike at his head, but his lifted right arm stiffened in the very act of striking and he could not draw it back to him. He let go the sword and let it fall on the ground. Seeing this, his comrades raised a shout to heaven begging the saint to declare to them kindly what they were to do. And he made the sign of salvation and restored the arm to health. The man was converted on the spot and received the tonsure and is now reckoned a most faithful monk. And two dukes who listened to him returned safe to their native place but those who despised his command perished wretchedly in the province. Many of them were seized with demons and cried: "Why, holy and blessed one, do you so torture and burn us?" And he laid his I hand on them and cured them. After this there was a man of Angers who in a severe fever had lost both speech and hearing, and when he got better of the fever he continued deaf and dumb. Now a deacon was sent from that province to Rome to obtain relics of the blessed apostles and other saints who protect that city. And when he came to this infirm person's relatives they begged him to take him as a companion on the journey, believing that if he reached the tombs of the blessed apostles he would forthwith be cured. They went on their way and came to the place where the blessed Hospicius lived. After greeting and kissing him, the deacon told the purpose of his journey and said he was starting for Rome and asked the holy man to recommend him to ship captains who were friends of his. And while he was still staying there the blessed man felt that power was in him through the spirit of the Lord. And he said to the deacon: "I beg you to bring to my sight the infirm person who is the companion of your journey." The deacon made no delay but went swiftly to his lodging and found the infirm person full of fever, and he indicated by signs that there was a humming in his ears. The deacon seized him and led him to the saint of God. The holy man took hold of his hair and drew his head into the window, and taking oil that had been blessed, he took hold of his tongue with his left hand and poured the oil in his mouth and on the top of his head, saying: "In the name of my Lord Jesus Christ let your ears be opened and let that power - which once drove a wicked demon from a deaf and dumb man open your lips." Having said this, he asked him his name, and he answered in a clear voice: "I am called so­and­so." When the deacon saw this he said: "I give thee endless thanks, Jesus Christ, who deignest to work such miracles by thy servant. I was seeking Peter, I was seeking Paul and Lawrence and the others who made Rome glorious with their blood; here I have found them all, I have discovered every one." As he was saying this with loud weeping and great admiration the man of God, wholly intent on avoiding vanity, said: "Be silent, beloved brother, it is not I who do this, but he who created the universe out of nothing, who took on man for our sake, and gave sight to the blind, hearing to the deaf, speech to the dumb; who bestowed on lepers the skin they had before, on the dead life, and on all the infirm abundant healing." Then the deacon said farewell and departed rejoicing with his comrades. When they had gone a certain Dominic - this was the man's name - who had been blind from birth, came to prove his miraculous power, and when he had dwelt in the monastery two or three months praying and fasting, at length the man of God called him to him and said: "Do you wish to recover your sight?" And he replied: "I wish to know a thing unknown. For I do not know what the light is. Only one thing I know, that it is praised by men. But I have not deserved to see from the beginning of my life until now." Then he made the holy cross over his eyes with oil that had been blessed and said: "In the name of Jesus Christ our redeemer let your eyes be opened." And at once his eyes were opened and he wondered and contemplated the great works of God which he saw in this world. Then a certain woman who, as she herself asserted, had three demons, was brought to him. And he blessed her with a sacred touch and made the cross in holy oil on her forehead and the demons were driven out and she departed cleansed. Moreover he cured by his blessing a girl who was vexed with an unclean spirit. And when the day of his death was drawing nigh he summoned the prior of the monastery and said: "Bring iron tools to open the wall and send messengers to the bishop of the city to come and bury me; for on the third day I shall depart from this world and go to the appointed rest which the Lord has promised me." Upon this the prior sent messengers to the bishop of Nice to carry this word. After this one Crescens went to his window and seeing him bound with chains and full of worms he said: "O my master, how can you bear such tortures so bravely?" And he replied: "He comforts me in whose name I suffer this. For I tell you that I am now freed from these bonds and am going to my rest." When the third day came he laid aside the chains by which he was bound and prostrated himself in prayer, and after he had prayed and wept a long time he lay down on a bench and stretched out his feet and raised his hands to heaven and thanked God and died. And immediately all the worms that were boring through his holy limbs disappeared. And bishop Austadius came and most carefully placed the blessed body in the grave. All these things I learned from the lips of the very deaf and dumb man who as I related above was healed by him. He told me many other miracles of his but I have been kept from describing them by the fact that I have been told that his life has been written by many persons.